The number one telecommunication company in the Philippines has announced LTE-Advance, first tested on Davao City and Metro Manila, the test shows extraordinary results that goes above 200mbps download speed and 12mbps upload speed. A significant change in internet speed in the Philippines which will change the course of history in terms of telecommunication technology. The 210.85mbps download speed is not only for show, as they test a HD video call using Skype which yields no lags results, they also test to download a 10MB file which only run a few milliseconds, and viola! Download finish. They also test uploading the said file which only last about 1 second. This new mobile broadband technology is not only capped at 200mbps download speed, as it can go as much as 700mbps, in fact 200mbps is the floor speed in LTE-Advance. LTE-Advance is available on high-profile countries such as United Kingdom, America, and South Korea. Making Philippines part of the game, an absolute nationwide upgrade will be expected soon. IMO SMART Communication will target first high-profile city's in the Philippines, then the rest will follow. Is LTE-Advance Really Worth It? LTE-Advance is in fact twice the speed of LTE/4G, but as I've said before "premium services yields premium cost". I guess LTE alone is enough to make things in the internet smooth and fluid, unless you download lots of stuffs in a limited time, LTE-Advance is for you. 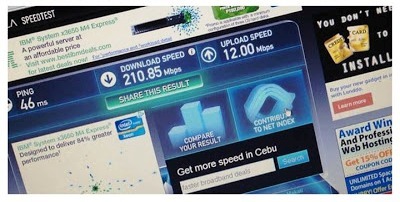 SMART has still lots of things to do, maybe instead on jumping to LTE-Advance, they should focus more on LTE/4G, why? Lots of customer is still facing weak signals and sudden change of network from 4G to 3G, and take note, its still not available nationwide yet.